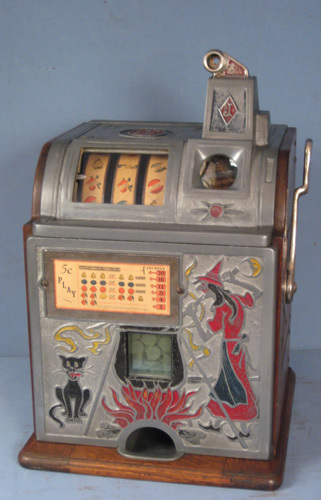 Hello I need some help identifying a German slot machine! I recently found it and it’s pretty cool! I have uploaded a photo of you have any info please share! Nice looking Rotomint you have there! As you probably already know it is 220 volts. I have a Rotomat...the difference is, Rotomat has 3 drums spinning on a vertical axis and Rotomint has 3 discs spinning on a horizontal axis. I made a special cord to test it on my dryer outlet. Quickly got tired of lugging it to the basement and bought a 110vac to 220vac converter. Mine has problems I haven't fixed yet. The small rubber wheels that spin the drums go, but the solenoid that stop the drums won't release.